What does the Arts Office do? 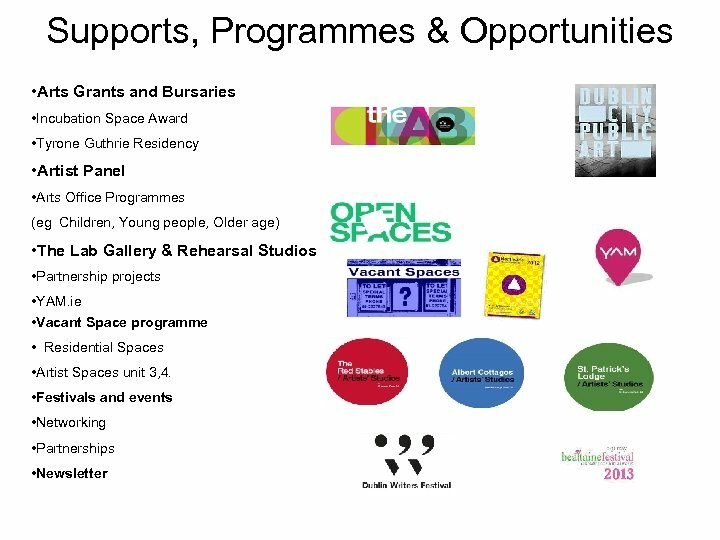 Dublin City Council Arts Office provides a wide range of Art facilities, programmes and services to the people of Dublin and visitors. 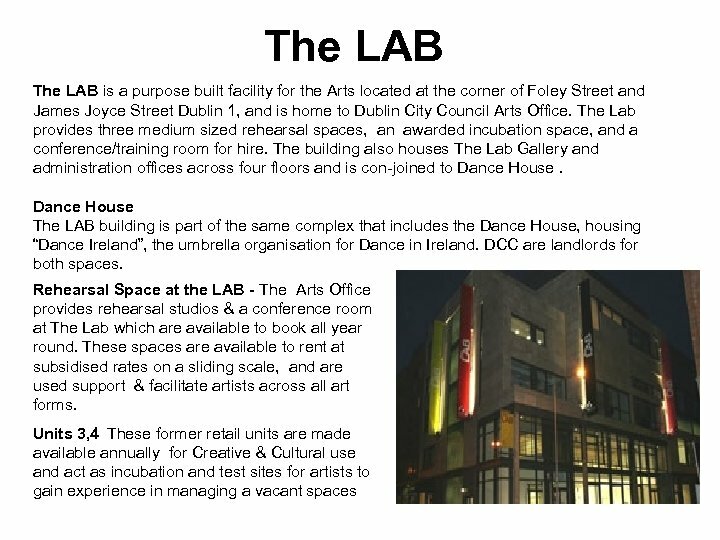 The Arts Office is based at The Lab in Foley Street, Dublin 1 and works with and collaborates with relevant stakeholders to advance the cultural life of the city. 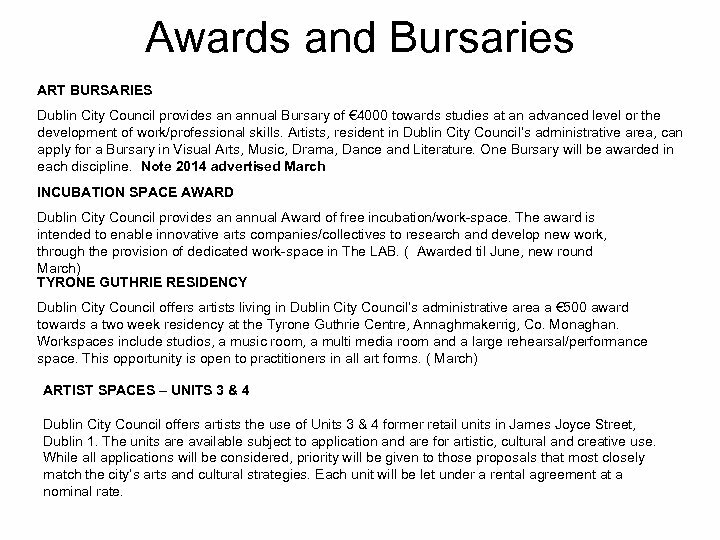 Awards and Bursaries ART BURSARIES Dublin City Council provides an annual Bursary of € 4000 towards studies at an advanced level or the development of work/professional skills. 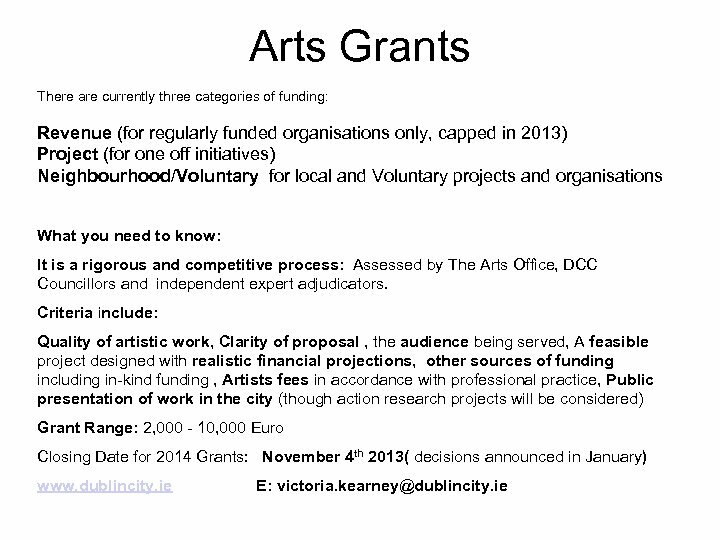 Artists, resident in Dublin City Council’s administrative area, can apply for a Bursary in Visual Arts, Music, Drama, Dance and Literature. One Bursary will be awarded in each discipline. Note 2014 advertised March INCUBATION SPACE AWARD Dublin City Council provides an annual Award of free incubation/work-space. The award is intended to enable innovative arts companies/collectives to research and develop new work, through the provision of dedicated work-space in The LAB. ( Awarded til June, new round March) TYRONE GUTHRIE RESIDENCY Dublin City Council offers artists living in Dublin City Council’s administrative area a € 500 award towards a two week residency at the Tyrone Guthrie Centre, Annaghmakerrig, Co. Monaghan. Workspaces include studios, a music room, a multi media room and a large rehearsal/performance space. This opportunity is open to practitioners in all art forms. ( March) ARTIST SPACES – UNITS 3 & 4 Dublin City Council offers artists the use of Units 3 & 4 former retail units in James Joyce Street, Dublin 1. The units are available subject to application and are for artistic, cultural and creative use. While all applications will be considered, priority will be given to those proposals that most closely match the city’s arts and cultural strategies. Each unit will be let under a rental agreement at a nominal rate. 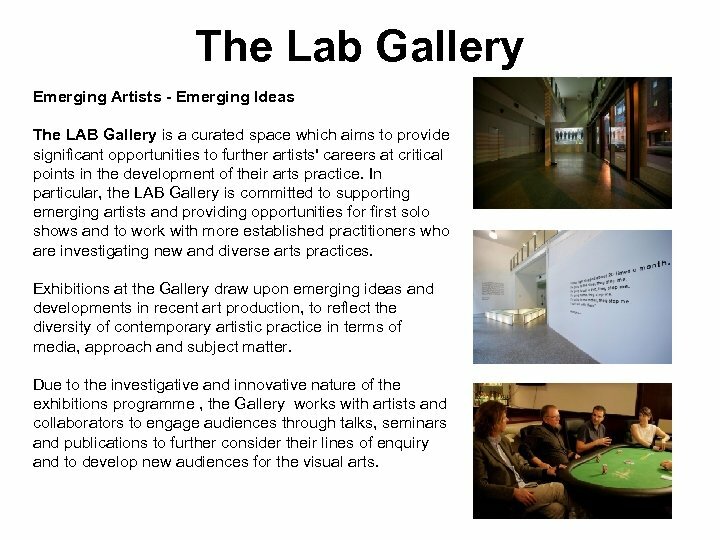 The Lab Gallery Emerging Artists - Emerging Ideas The LAB Gallery is a curated space which aims to provide significant opportunities to further artists' careers at critical points in the development of their arts practice. In particular, the LAB Gallery is committed to supporting emerging artists and providing opportunities for first solo shows and to work with more established practitioners who are investigating new and diverse arts practices. Exhibitions at the Gallery draw upon emerging ideas and developments in recent art production, to reflect the diversity of contemporary artistic practice in terms of media, approach and subject matter. Due to the investigative and innovative nature of the exhibitions programme , the Gallery works with artists and collaborators to engage audiences through talks, seminars and publications to further consider their lines of enquiry and to develop new audiences for the visual arts. 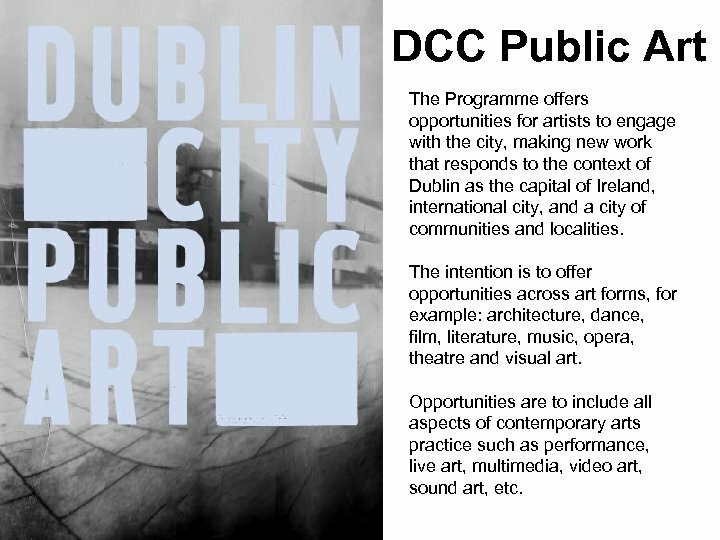 DCC Public Art The Programme offers opportunities for artists to engage with the city, making new work that responds to the context of Dublin as the capital of Ireland, international city, and a city of communities and localities. The intention is to offer opportunities across art forms, for example: architecture, dance, film, literature, music, opera, theatre and visual art. 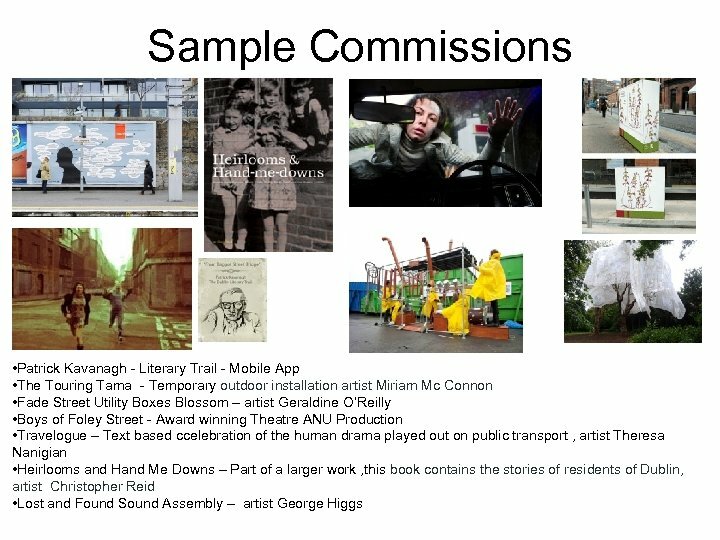 Opportunities are to include all aspects of contemporary arts practice such as performance, live art, multimedia, video art, sound art, etc. Vacant Spaces The Vacant Space Initiative is a project that has grown from the amount of unused retail and commercial space. Phase One • Pilot programme included several properties from private owners. 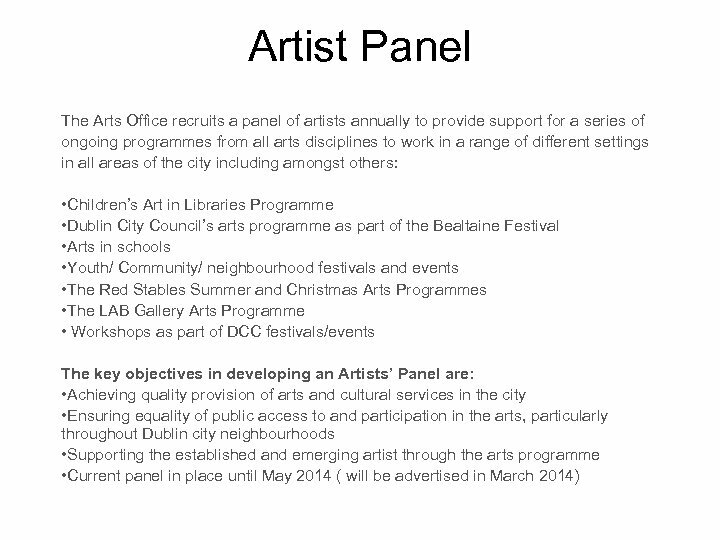 • Hosted seminars • Set up a vacant spaces register for Artists and property owners. • Made available a list and details of all properties on-line. • Facilitated a viewing day for artists. Notes - All the properties in the pilot phase were subsequently let or taken off the market. 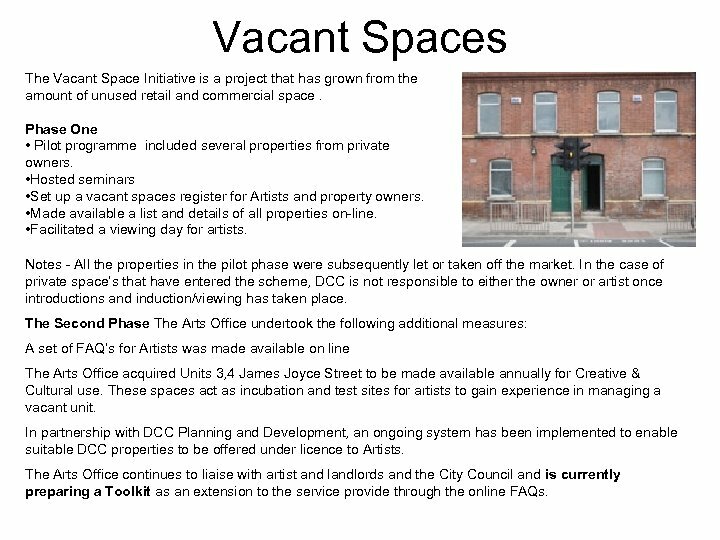 In the case of private space’s that have entered the scheme, DCC is not responsible to either the owner or artist once introductions and induction/viewing has taken place. 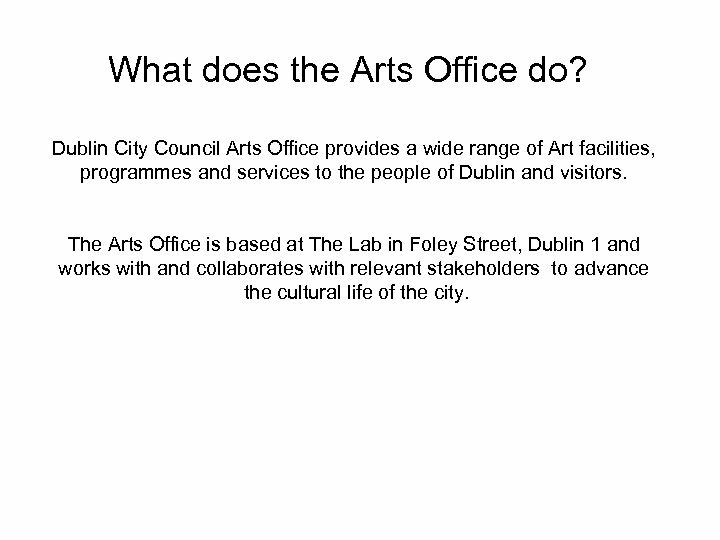 The Second Phase The Arts Office undertook the following additional measures: A set of FAQ’s for Artists was made available on line The Arts Office acquired Units 3, 4 James Joyce Street to be made available annually for Creative & Cultural use. These spaces act as incubation and test sites for artists to gain experience in managing a vacant unit. 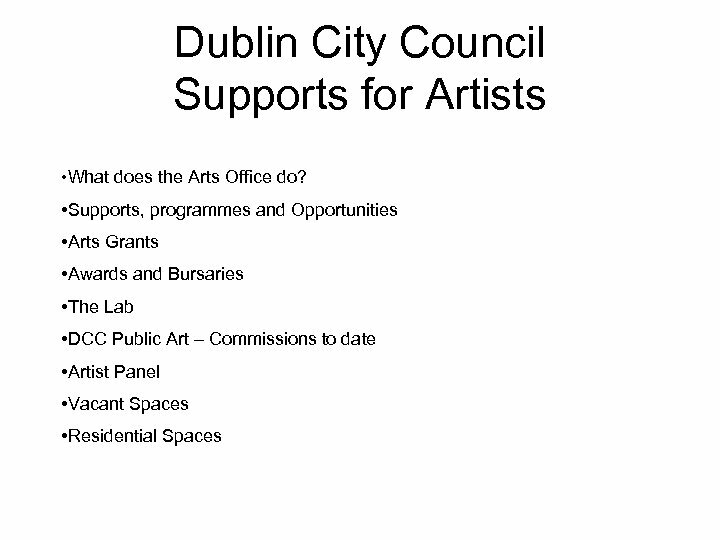 In partnership with DCC Planning and Development, an ongoing system has been implemented to enable suitable DCC properties to be offered under licence to Artists. The Arts Office continues to liaise with artist and landlords and the City Council and is currently preparing a Toolkit as an extension to the service provide through the online FAQs. 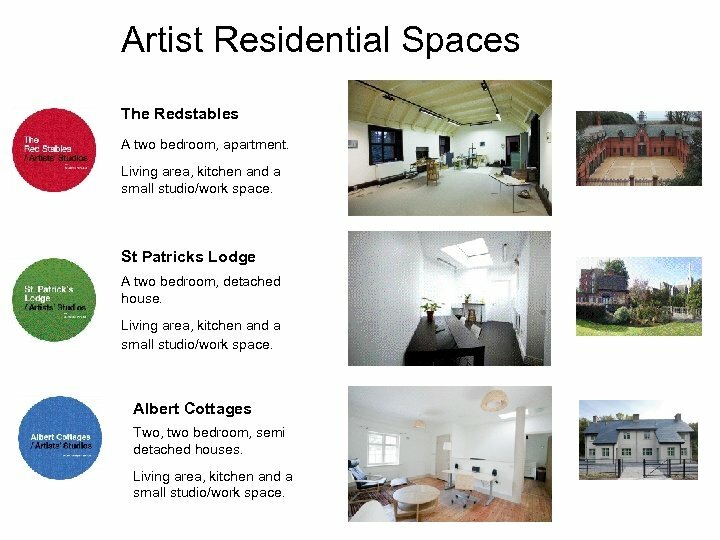 Artist Residential Spaces The Redstables A two bedroom, apartment. Living area, kitchen and a small studio/work space. St Patricks Lodge A two bedroom, detached house. Living area, kitchen and a small studio/work space. Albert Cottages Two, two bedroom, semi detached houses. Living area, kitchen and a small studio/work space.